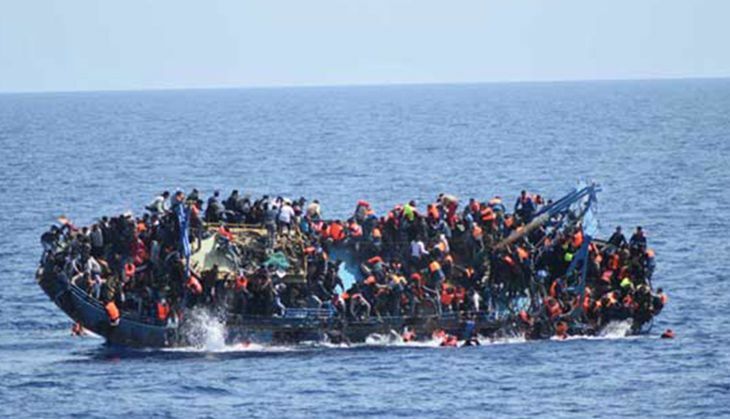 About 700 migrants are feared dead off the coast of Libya, due to shipwrecks in the Mediterranean. "The situation is chaotic, we cannot be sure of the numbers, but we fear up to 700 people may have drowned in three shipwrecks this week," NDTV quoted UNHCR spokesman Federico Fossi as saying. After a fishing boat capsized last Thursday, 500 migrants were declared lost. Of the 500, 40 were children, including new born babies. A 100 people went missing after a boat sank on Wednesday and 45 bodies were recovered from a wreck on Friday. According to an NDTV report, Carlotta Sami, UNHCR spokeswoman, tweeted, "We'll never know the exact number, we'll never know their identity, but survivors tell that over 500 human beings died." Giovanna Di Benedetto, Save the Children's spokesperson in Sicily, said it was impossible to verify the numbers involved in the acccidents. However, survivors reported of around 1,100 people setting out from Sabratha in Libya on Wednesday in two fishing boats and a dinghy, NDTV reported. "The first boat, carrying some 500 people, was reportedly towing the second, which was carrying another 500. But the second boat began to sink. Some people tried to swim to the first boat, others held onto the rope linking the vessels," she said. According to the survivors, the first boat's Sudanese captain cut the rope, which snapped back and decapitated a woman, NDTV reported. The second boat quickly sank, taking those packed tightly into the hold down with it. The Sudanese was arrested on his arrival in Pozzallo along with three other suspected human traffickers. Will the NGT extend the diesel car ban to 11 more cities in India?